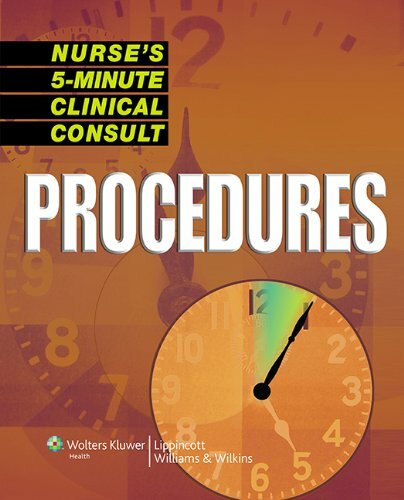 Nurse’s 5-Minute Clinical Consult: Procedures covers over 300 basic and advanced nursing procedures–from arterial pressure monitoring to wound irrigation–with equipment lists, essential steps, special considerations, patient teaching points, and documentation guidelines in a quick-scanning format. Procedures are organized alphabetically, and each is presented on a two-page spread with consistent headings, including description, contraindications, equipment list, preparation, key steps, special considerations, complications, patient teaching, and documentation. Recurring icons highlight tips for troubleshooting equipment problems, information that is critical for patient safety, and age-related concerns along the lifespan continuum. Numerous quick-glance tables, charts, and illustrations complement the text.